Life can get so busy! It seems I’m running all the time, doing this, doing that, doing something else. Yet I stop sometimes in my day and find hours have passed, and I have no idea what I’ve actually done. There’s nothing I can tick off my to-do list, though I’ve been busy busy busy! I’ve beat myself up over not getting enough done, especially if I slow down, thinking I’ve wasted that time. Sure, sometimes I really am just wasting time on stuff I’d be better forgetting about. But lately, I’ve started wondering if some of those “wasted” hours might be the most important parts of my days. Maybe that half-hour when I set aside my plans and chatted with a worried neighbour counts for far more than I realise. Maybe there’s worth in that quiet ten minutes daydreaming, holding hopes before the Lord. Or the twenty minutes searching out a half-remembered Bible verse. Maybe, we don’t always have to be doing BIG IMPORTANT THINGS and meeting goals and ticking stuff off our to-do lists. Maybe those little quiet things are the cracks where love gets into our lives. I’ve been writing a lot less the last few months, because in that not so subtle way He sometimes has, God kept putting roadblock after roadblock in my way. He whacked me with the realisation that I was putting my writing plans and my release deadlines ahead of my marriage, when He wanted my husband to be my #1 priority. He made me see just how many times I said to my ill, disabled sweetheart, “Not now, I’m working.” My husband never said anything, but I knew he felt he came second to my writing – and he was right! No matter that the income from my writing helps support us. No matter what I said or wanted to believe. My behaviour showed that I didn’t truly put him ahead of my work. Plus I had a bad habit of using the time we did have talking in telling him what I thought or giving advice on what he should do. Or I was multi-tasking, on the laptop, answering emails or messages at the same time. It hasn’t been easy, but I’ve started to give more time to sitting quietly listening to my husband, making sure he has my full attention. Like I used to all those years ago when we were dating. I shut the laptop. I go downstairs and sit on the second step from the bottom, near the chair he finds most comfortable. And I listen. Already, in an astonishingly short time, his health has improved, and so has our relationship. He feels more heard, more respected, more truly loved. Listening to him proves that I do love him. All this made me see – God wants the same sort of attention from me. I’ve been doing my relationship with God the same way as my relationship with my husband. The time He wants with me isn’t just me giving Him a fraction of my attention while I do other things, or me asking Him for what I want from Him. Writing Christian books for Him isn’t enough to show I love Him. God wants me to show that I love and respect him by being still and listening to Him. So, I have no idea when my next book will be released. But I do know that God loves me enough to ask me to slow down and rest in Him, so He can prove to me just how much He loves me and wants to support and care for me. And He loves you the same way too. To those loved by God the Father, called and kept safe by Jesus Christ. 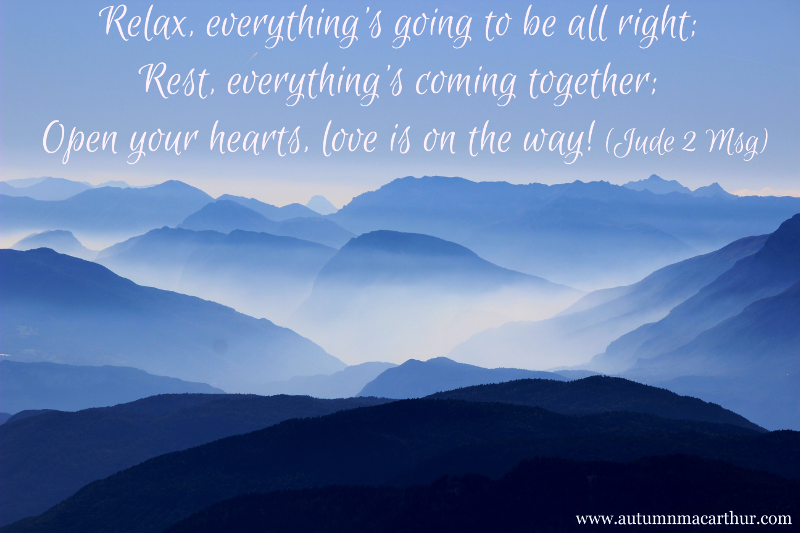 Relax, everything’s going to be all right; rest, everything’s coming together; open your hearts, love is on the way! Just last night I was having a conversation with someone about how often we give God our leftovers instead of our very best. (Don’t ask me how many times I’ve done that in my own marriage, too…) Beautifully said, Autumn, and I appreciate your transparency! Hugs! Autumn, what a beautiful post! Thank you for sharing. Such a beautiful post, Autumn. I can definitely relate. Thank you for the gentle reminder that we need to honor God and our loved ones by loving others well. Thanks Heidi. It’s so easy to slip into putting other things that look just as important first. I beat myself up EVERY day for the time I have wasted. Maybe I need to pay attention to what I’m doing with those wasted minutes. Maybe they’re not as wasted as I thought? I had an ‘ouch’ moment when you talked about multi-tasking while listening to your husband too. I know how good it makes me feel (how loved) when he stops what he’s doing and actually looks at me and really listens. A keepable blog to remind me of those very important things. The time I spent reading it was definitely NOT time wasted! Feeling heard and understood is such a big part of feeling loved, I’m finding. I read Five Love Languages, and it’s a great book, but he didn’t really mention listening. Surely, that’s got to be part of everyone’s love language! And not often easy, when we feel pulled so many directions and our minds are going a million miles an hour with all we feel we have to do. The Lord has been speaking to me about how I always feel guilty when I’m not writing, when there is so much more to my life than that, especially my husband, children and grandchildren. Some days (weeks, even) belong to them. This was a warm, wonderful acknowledgement that my thoughts transcend my own and go to God’s loving heart. Thanks, Autumn, for having the courage to share. Your words mean a lot. That’s it exactly Deb. God calls us to write, but he calls us to love, first. I don’t know why I’ve found it such a tough lesson to learn, I give God a hard time, sometimes! A beautiful and painfully honest reminder. Thank you. Thank you, Autumn. As always, a beautiful and poignant post. I think most of us are guilty of neglecting the needs of others at times in order to send one more email, write one more paragraph, post on FB… The title of this posts sums it up very well, and once again, you have touched my heart. Blessings to you, and I’m thrilled to hear your hubby is improving. God bless you both. Thank you JoAnn :) That was the biggest and hardest thing for me to see, that my focus on my writing had become more than a Day Job, I was letting it take over my life, and worse, resenting even the leftovers I gave my husband. God is so good, and He’s reshaping my life in a new way. It is so easy to fall into the”busy” trap. Thank you for the great reminder that time we’ll spent isn’t completing a check list but investing in a relationship. Hmmm…sounds like a good storyline…. Thank you for sharing, while I was thinking about what you had written it came to me again that God wants us to choose Him, just like we want to be chosen. All the technology is definitely an issue around here too, Trixi. When I’m messaging a friend while my husband is speaking, no wonder he doesn’t feel heard. Ouch!